I can’t believe this will be our 12th winner. 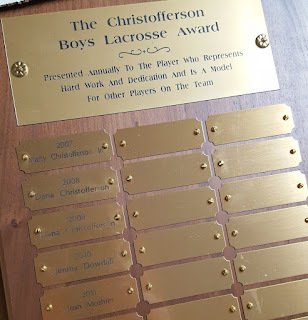 Starting with our first year of Varsity Lacrosse in 2007 "The Christofferson Boys Lacrosse Award" has been presented annually by the coach to the player who represents hard work and dedication and is a model for other players on the team. Without the hard work and dedication that Marty and Marianne Christofferson gave to the program for years, Dryden Lacrosse would not be where it is today. It continues to grow and succeed. 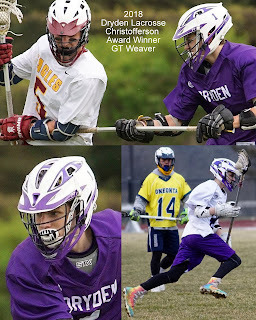 We are proud to announce that this year’s winner is GT WEAVER. The winner receives a certificate and will eventually be added to the award plaque. (see photo) We are working on finding a spot in the school’s athletic awards hall for it.